The Me 163B lacked the capability to taxi before take-off and after landing. This required specialised ground equipment. The Schlepper (tractor) made by Scheuch, the Scheuch-Schlepper, was used for this task. Note that it is often called 'Scheuschlepper' ('shy tractor') but that is not correct. The Scheuch-Schlepper could be used in two configurations: with a third wheel attached, to tow the Komet when fitted with its starting dolly, or with a special lifting device, acting as a recovery vehicle for landed Komets. This page tries to illustrate this very special piece of ground equipment. Wilfried Thorwirth was kind enough to send two scans from the above source. The following technical data is taken from the 1942 source. Data for two versions is listed, a basic version with the 6 hp engine and main gearbox only, and the 8 hp version fitted with a secondary gearbox. Some of the data is inconsistent with the data mentioned in the text. Gears 2 fw 3 fw, 1 rev. Close to nothing was known about the military Scheuch-Schlepper except the photos shown below. But this has changed since Martin Kämpf obtained a wartime Scheuch-Schlepper (see below) and started investigating its background. He quickly found out that Rudolf Scheuch is still in good health. Rudolf and Eugen Scheuch developed the Scheuch-Schlepper and other tractors, including a more conventional four-wheel design, that was used as a bomb-cart tractor ('Bombentransporter'), one of which is preserved by Museum 'Haus Schwandke' in Triptis. Rudolf Scheuch still has drawings and a good memory of the details. For example, when asked about the second steering wheel, he remembered that this wheel could be used to steer the Schlepper by a walking crewman, for example in case the Schlepper was manoeuvred under the wing of an aircraft. Throttle and clutch were operated using hand controls. The second wheel was only used for Komet-Schleppers, and not for Schleppers used for V1 operations. A detail not visible in the photos is that a starter crank was attached to the side of the engine cover, since the standard version of the Scheuch-Schlepper didn't have a starter motor. According to Mr. Scheuch, between 500 and 600 Schleppers were built. Factory drawings are still in existence! The Scheuch-Schlepper was likely used extensively in Komet operations, yet few photos seem to exist. All the site's wartime Komet photos showing the Scheuch-Schlepper are presented below. Use your browser's 'Back' button to return to this page. The Scheuch-Schlepper was also used for Fi 103 (V1) operations. The only photographic evidence found so far of this use of the Scheuch-Schlepper was kindly sent by Robert Weyers. It comes from the November 1982 issue of Modell Magazin, that contains an article by Hans Laechler about the V-1 equipped He 111's of KG53 in the autumn of 1944, based in Venlo or possibly Varelbusch. In the book Peenemünde-West by Botho Stüwe, a list of Fi 103 (V1) manufacturing firms is shown (pages 593-598). Included in the overview is an entry for the Scheuch-Schlepper, manufactured by the firm of Bruno Müller in Triptis/Thüringen (manufacturer's code 'ohv'). Björn Schewe and Christian Grundmann (Germany) own an actual Scheuch-Schlepper, and kindly supplied the following photos. It was built in 1944, it was used on a Bavarian airfield, and it is fitted with a Volkswagen engine. Björn and Christian are very interested in learning more about the Scheuch-Schlepper, and would enjoy seeing photos, drawings or stories by former Schlepper drivers (we too!). Martin Kämpf from Germany also owns an original Scheuch-Schlepper. He obtained it in autumn 2004 from the original owner, who found two of them shortly after the war in the Kölln-Siegen-Koblenz area. The second Schlepper was stripped of most of its parts, and the rest was scrapped. The surviving example is in a good condition considering its age, and complete except for the exhaust. The engine is a 1954 Volkswagen engine. Restoration has started in January 2005, with the removal of the engine and gearbox. Martin reports that the 'Typenschild' has the following data: Gerät Nr. : 121-206A / Werk-Nr. : 385 / Hersteller: ohv. The manufacturer code 'ohv' confirms that Scheuch-Schleppers were built by Bruno Müller in Triptis/Thüringen. The engine number is -1-0832877 from 1954, the gearbox is number T*2-029475* from 1943. The gearbox is a standard Volkswagen Käfer unit, and it is probably the Schlepper's original gearbox. The Schlepper doesn't have the second steering wheel, since it was probably used for V1 operations. These two surviving Schleppers show some interesting differences: the front fenders, the towing hooks at the front on the sides of the engine compartment, the wheels, the lighting, and the different rear towing hook. Like Björn and Christian, Martin is also very interested in any information on the Schlepper or its manufacturer. Martin finished the restoration late May, after some five months of work. Some parts were worn, but that is not surprising for a 60 year old vehicle. The rear wheel is now detachable, as it used to be when it was designed. The engine and gearbox were sandblasted. The color should be RAL 7028 Dunkelgelb II, but there are no surviving samples of this color. Martin considers adding the second steering wheel, to be built from original drawings. The first two photos below show much of the internals of the Scheuch-Schlepper. A box-shaped gearbox is located near each wheel; it contains a chain-driven reduction gear of about 3:1. Two versions of this reduction gear were used, one giving a top speed of 16 km/h, the other 32 km/h. Martin's Schlepper reaches the latter speed, although he comments that "considering the driving characteristics the top speed is frightfully high". Martin also noted that the rear wheels jumps easily, and under heavy braking it tends to ride on the front wheels. The remainder of the photos show the completed Schlepper with only minor parts still to be added, such as the engine starter crank, which is placed in the tube on the left front fender, and then doubles as a support for the passenger. All in all an excellent job! Martin plans to drive the Schlepper with its designer Rudolf Scheuch. The restoration also resulted in a much better understanding of the Schlepper's operation. For example, the steering wheel has three settings, controlled by a small lever on top of the steering housing. The three setting are coarse, fine (a reduction gear is switched in) and off. For the latter situation the Schlepper can be steered via differential braking on the front wheels, using a big lever as seen in this photo. When the lever is moved forward, the left wheel is braked, and the Schlepper turns left, and vice-versa. The exact use of the second steering method is not clear yet. The book 'Ackerschlepper - Historische Dokumente aus der Geschichte des deutschen Traktorenbau Band 2' by Wolfgang Gebhardt contains an old advertisement for the 'Scheuch Einachsschlepper'. 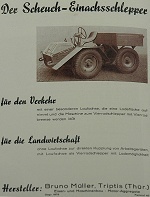 The photo in the advertisement shows a vehicle that featured the front end of the military Scheuch-Schlepper combined with a open box trailer. An internet search yielded very little additional information. The 'Scheuch Einachsschlepper' can be found in the book that is availabe with the titles 'DDR-Landmaschinen und Traktoren 1945-1990' and 'DDR Traktoren und Landmaschinen 1945-1990'. The following list is a summary of the extensive Me 163 kits and accessories page. Lastly, a Japanese modeler scratch-built a fabulous 1/32 Scheuch-Schlepper. The full build report can be found on page 1 and page 2 (Google translations of page 1 and page 2). One comment: to my eye, either the figures are too small, or the Schlepper is oversized. The drawings were made by Hubert Cance from France, a prolific drawing artist and modeler. His drawings can be found in various books, Aviation News, Air Pictorial, Steel Masters, and some of his models serve as masters for resin kits.